Yes, my blog has somewhat faltered/sputtered/tottered of late. Blame it on me moving to a new city and starting a new job. You might say DC has me – wait for it – swamped. Anyway, onwards! Curiosity convinced me to watch Citizen Kane and see whether it lived up to all the hype. Citizen Kane is a film about a man who achieved it all – fame, fortune, power – only to lose it all because of his gradual slide into meglomania. On the whole, I found the film adequate. It did an okay job making Kane’s personal and professional journey interesting. And Orson Welles did an okay job playing the role of a great man gone mad. Unfortunately, the plot was a bit sensationalist (did he really have to be the greatest and the best at everything?). As for Welles himself, he didn’t capture Kane’s insanity well enough (a guy who lives alone in a fortress is probably more than a little quirky). Woody Allen is back and (almost) brilliant as ever. Owen Wilson stars as Gil Pender, a Hollywood screenwriter stuck in a loveless relationship in the City of Love. Thanks to time-travel (or hallucinations? ), Pender discovers a way to mingle with the likes of Ernest Hemingway and Pablo Picasso in the famed Parisian art salons. I thought the film was okay. As usual, Woody Allen put an interesting spin on the otherwise mundane. The time-travel bit added just enough spice to make this something more than a run-of-the-mill “finding yourself” film. But there were issues with the dialogue (stilted) and acting (sterile) that took away from what was otherwise a good movie. I fear my fawning review of Tous Les Soleils has unmasked me as the romantic sap that I really am. Yes, I love Amelie and similar Euro romcoms and Tous Les Soleils follows in that heartwarming tradition. The film is about a widowed father who has struggled to fall in love again after the tragic loss of his wife. The film was perfect – music, dialogue, acting, plot, atmosphere – it had it all. What was especially refreshing about Tous Les Soleils was its unique take on two questions: Why people fall in love and what does it mean to be a family. On falling in love, the happy couple are brought together by shared tragedies (the loss of a mother or wife) rather than Hollywood-esque love-at-first-sight. On family structure, the main character here is a widow who shares a small apartment with his brother and daughter, an uncommon arrangement that the director convinces you is as natural as a nuclear family. Innovation often involves the novel combination of simple things. For example, a spork joins the obvious in perhaps a non-obvious way: Scooping with piercing in a single form. According to Google, a prime candidate for utensil of the future is indeed the spork. But maybe we’ve got the wrong combination. Maybe it’s not going to be a fork and spoon, but something else. We might instead combine the ingrained instinct to eat with our hands (see: any infant) with the streamlined design of modern utensils. I would call this technology the “gutensil” – the glove utensil. It’s the perfect mix because it does a better job of taking advantage of the superior dexterity of the digits. When we make a piercing motion, we jab our fingers; hence, the fork/knife parts would be on the glove tips. When we scoop a liquid, we press our fingers together; hence, the gloves would have webbed fingers. Utensil of the future: Spork or gutensil? 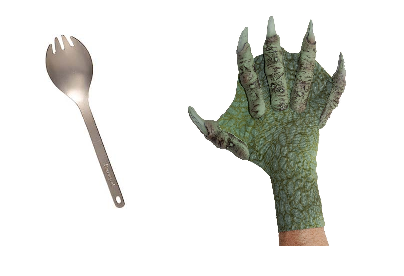 So what would you prefer, a gutensil (dinosaur hands) or a spork? I guess I should have prepared a more visually-appealing rendition of a gutensil, but there’s laziness for you.